Four persons, three men and a woman, have been arrested at Ashaiman, near Tema, for allegedly possessing firearms without lawful authority. Two of the suspects, Tanko Abdul Rahman and Bright Tawiah (alias Kpetseku), both 25 years, were arrested by the Tema Regional Police Command at their hideout at Washington, a suburb of Ashaiman, last Sunday dawn. 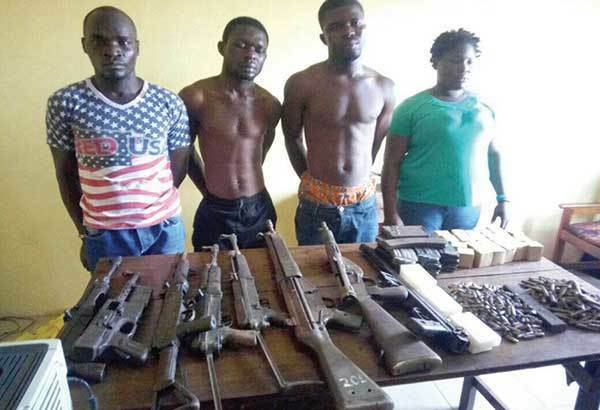 The two then led the police to a block factory which belonged to one Dogo America at Gbetsile, also a suburb of Ashaiman, where the other suspects, Michael Dzogbema, alias Yeye (35), a caretaker of the block factory, and his 25-year-old girlfriend, Matilda Sitsofe, alias Atsufe, were also apprehended. A search conducted in a container on the compound led to the retrieval of four SMG rifles, one G3 rifle, three SLR rifles, 12 magazines and 1,089 live ammunition. Also retrieved was one jungle motorbike. The Tema Regional Police Commander, Assistant Superintendent of Police (ASP) Ms Juliana Obeng, who confirmed the incident, said the items retrieved had been retained to serve as evidence while investigations were still underway. She said preliminary investigations by the police revealed that the weapons were used by land guards for their activities at Gbetsile and its environs. The suspects, she said, were currently in police custody assisting in investigations and would be processed for court after investigations had been completed.